Inkspire Me: Sale-a-Bration is Here! 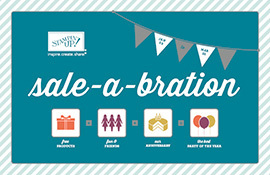 Sale-a-Bration is a two month promotion (Jan 22- Mar 22) where you can get FREE products with every $60 order. There are more benefits for hostesses during this time and people who join SU! during this promotion get even more in their Starter Kit! Contact me to learn more or to place your Sale-a-Bration order!